A number of restaurants on the island of Bali are choosing to take their time to support local producers. In an age of mass production and fast food, finding eco-conscious, healthy food can be a challenge. Bali’s Slow Food movement is gradually bringing the concept of community back into food by connecting local farmers who grow fresh, healthy and chemically-free produce, restaurant proprietors and foodies who care about what they put on their plate. Originating in Italy in 1989 when a group of protesters took a stand against the opening of McDonalds in the centre of Rome, Slow Food has gradually made its way to Bali. Now active in around 150 counties, the grassroots movement reached the shores of Bali in 2009. To make foodies’ lives easier, Slow Food Bali has created a list of restaurants – both mainstream and off-the-beaten-path – that use at least 75 percent organic, local ingredients. Here are a few options that have gained Slow Food Bali’s Snail of Approval certification. Cuca specializes in tapas made from fresh ingredients sourced exclusively (100 percent) from Indonesia. This sets the establishment apart from most other restaurants on the island, which import a portion of their ingredients from abroad. Cuca’s dishes are meant to be shared and the small portions mean that patrons are able to try a wide variety of options on the menu – all made from the finest, freshest local produce. “Our most popular dishes include the barbequed octopus, the crispy fried chicken,” Entizna says. In addition to a stylish dining room and alfresco dining, Cuca offers a more out-of-the-box experience for those who prefer to take an active interest in the preparation of their meal. The restaurant’s 8-metre counter offers front row seats to where some of the best ingredients on the island are transformed into culinary masterpieces. 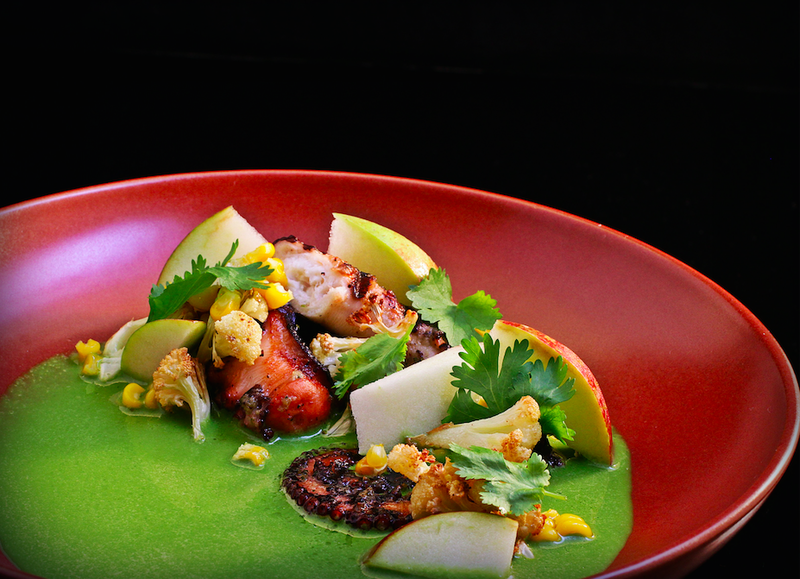 With the motto, “Modern Cuisine, Local Produce,” Locavore hasn’t acquired its name by mistake. A locavore is a person whose diets consist mainly of locally (within a 250-kilometre radius) grown or produced food. “Our philosophy is to use as much local produce as possible to create modern European dishes,” says the restaurant’s Indonesian chef and co-founder, Ray Adriansyah. To make the most of the local produce, the open-kitchen concept restaurant changes its menu according to the season. “Besides the a la carte menu, we have two tasting menus, a Locavore and a Herbivore menu – each comes in five or seven courses. We try to change a few of the items every Monday just to mix things up a bit,” Adriansyah says. And what about some of the most popular dishes on the menu? “The beef tartare is one of the favourites with our guests. We import the beef from Malang and serve it with wasabi leaf mayonnaise, pickled shallots, radish, and beef lard with herb brioche croutons on the side,” he says. 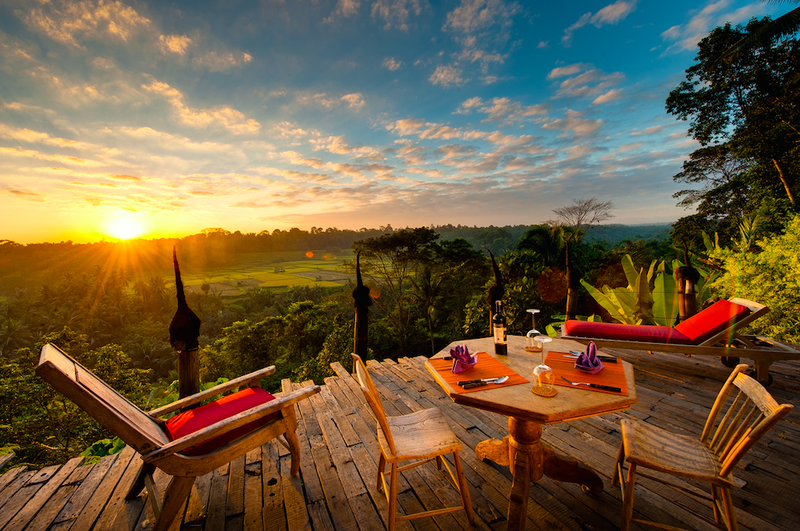 Set on the ridge of the Ayung River, 15 minutes from Ubud, Bambu Indah Dapoer is part of the Bambu Indah boutique hotel. 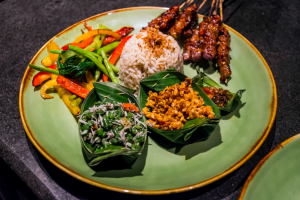 The restaurant specializes in authentic Balinese home-style cooking, served amidst beautifully restored antique Javanese teak homes and landscaped gardens. While the intricately designed restaurant is an attraction in itself – think natural stone, bamboo, terracotta floors and antique wood countertops – what is perhaps most significant about Bambu Indah Dapoer is that most of the restaurant’s dishes are made from the seasonal vegetables and herbs grown in the on-site permaculture gardens. “Our team of gardeners turns organic waste into compost and compost into nutritious soil to grow healthy produce that is used in our kitchens and for daily offerings to the island’s gods and goddesses,” says Diane Lion-Giustiniani, Bambu Indah’s operations manager. “About 90 percent of our ingredients are sourced from Indonesia. We have a network of local organic farmers and producers who come together to sell their produce to the Canggu community at our market,” says Andréa Drottholm, the co-owner of Samadi Bali. Drottholm says that she wants to show people that organic, vegetarian food need not be bland and boring. While Samadi Bali’s menu is very international, a lot of the recipes are of Indian origin. 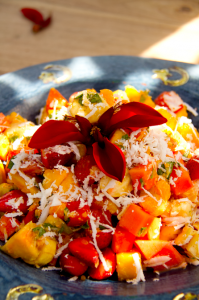 “Our most popular dishes include the Samadi Fruit Salad and Mysore Dosa,” she says. “We also have dishes that are suitable for people with special culinary preferences. We serve gluten free food, dairy free food, raw food and can cater to people with allergies,” she continues. A part of the Alila Ubud resort, the Plantation offers authentic Balinese and seasonal French-inspired dishes that celebrate local produce. The Balinese-style restaurant, with lofty coconut pillars and a traditional alang-alang (thatched) roof, sources 80 percent of its produce locally from the Ubud, Bedugul and Jimbaran areas, as well as the resort’s organic garden. The Plantation’s signature offering is the Royal Ubud Rijsttafel, which translates to Rice Table. A smorgasbord of dishes made for sharing with family and friends, the Rijsttafel is a perfect way to sample the traditional flavours of Bali. “All the dishes are made from recipes that have been handed down through generations, and everything is made from produce sourced in Ubud and the surrounding areas,” says Erwan Adri Wijaya, Plantation’s Executive Chef. While Wijaya laments the disappearance of traditional Balinese cuisine, and the fact that the growth in the number of fast food outlets is changing the island’s food culture, he also says that many people are choosing to return to local, organic produce.